'Home' is one of those games that sneaks up on you, no pun intended. At first glance, it doesn't seem like much but as you progress through the game you find that there is so much more to be found. Without going too far into spoiler territory, the story revolves around a character who wakes up with a damaged leg and then has to unravel a mystery surrounding his amnesia. This is a game that follows the traditional 'point-and-click' adventure style. 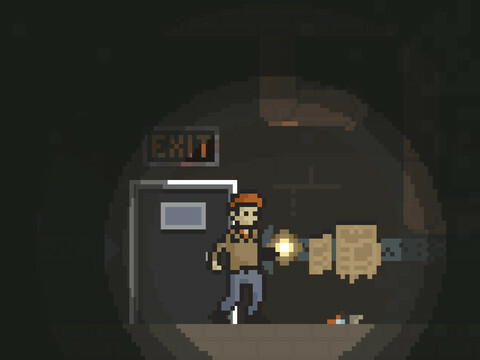 The graphics have a retro feel to them, and the use of the flashlight provides an appropriately creepy feeling. Likewise, the audio effects are excellent in the way they emphasize the tension being felt by the character (and by extension, the player). Tension and anticipation are the main draw of this game. Transitions between different rooms use a door animation that is reminiscent of the transitions between rooms in Resident Evil. You never know what to expect next around every corner or every item you pick up (or don't pick up), and the choices you make throughout the game impact the ending of the game. Folks, give this one a try. I recommend playing late at night in a dark, quiet room. The experience is so much better that way. Tagged with videogames, horror, iOS, iPhone, iPad. July 5, 2013 by DevWithTheHair DevWithTheHair.